Rediff.com » News » Look! Your postman has changed! Look! Your postman has changed! The Department of Posts is in for a change of image. The man who delivers your mail will no longer be seen in khaki. He will look fresh in shades of blue. The change is effective from today, October 1. The new attire for male employees is dark blue trousers and light blue full-sleeved shirt. Female employees will wear light blue sarees with a dark blue border. The women also have the option of wearing a light blue kameez with dark blue salwar and dupatta. The departmental logo will also be affixed on the uniforms. 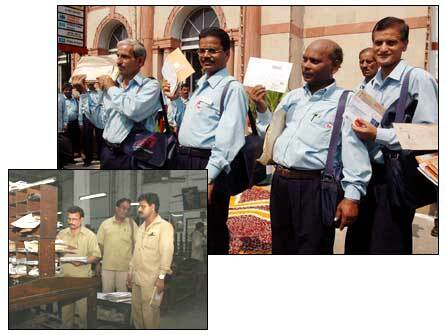 The postal department, which is in its 150th year, is aiming for a 'smart and corporate' look with this change of attire.